Adsorbent for static dehydration in a closed gas or liquid system. Used in packaging of drugs, electronic components and perishable chemicals. Water scavenger, paint and plastic systems. Separates normal paraffin’s from branched-chain and cyclic hydrocarbons through a selective adsorption process. Pressure swing purification of hydrogen. **Each type adsorbs listed molecules plus those of the preceding type. 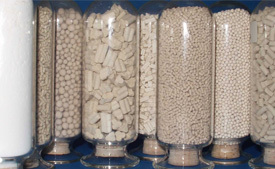 UI-94 is a unique 4A type molecular sieve recommended for dehydration of water-saturated natural gas and in systems where liquid carryover of water, hydrocarbons and treating chemicals is of concern. In this type of service, UI-94 adsorbent has demonstrated superior service life and more economical dehydration than other products typically used for natural gas drying. The special formulation of UI-94 molecular sieve resists coking from heavy hydrocarbons and treating chemicals, retains high water capacity and resists particle breakup caused by liquid carryover and reflux. UI-94 is used extensively in Natural Gas dehydrators around the globe. HgSIV is an “on-line regenerative” molecular sieve. It was specifically developed by UOP to remove low levels of mercury from process streams, such as natural gas and natural gas liquids. It can be installed in existing molecular sieve dehydration/purification units to remove mercury along with water and other impurities. HgSIV molecular sieve is capable of providing a mercury concentration of <0.01 ug/Nm3. APG-III is an improved 13X type molecular sieve developed for Air Plant Pre-purification Units (APPU) specifically for the removal of trace contaminants such as carbon dioxide, water and hydrocarbons. It has significantly higher CO2 capacity than standard 13X and provides the opportunity for reduced APPU costs. In new designs, APG-III can lead to reduced vessel sizes, lower pressure drop and lower regeneration costs. In existing or under-designed units, APG-III can be used to increase throughput in the existing vessels and within the pressure drop constraints of the design. Lower operating costs and longer adsorbent life are achievable for both new and existing units. PSAO2 XP is UOP’s next generation molecular sieve specifically designed for use in industrial oxygen generators that employ a pressure swing adsorption (PSA) cycle for high purity (90-95%) oxygen. PSAO2 XP’s superior performance is directly related to its enhanced N2/O2 selectivity relative to standard PSAO2 type molecular sieves. A-201 is a spherical Activated Alumina that has a high surface area, adsorption capacity, and abrasion resistance. A-201 Activated Alumina is used as a dessicant, or drying agent for industrial liquids and gases, such as air, nitrogen, oxygen, carbon dioxide and hydrocarbons. CLR-204 adsorbent is the preferred product for removing trace HCl from Olefin-containing hydrocarbon streams. CLR-204 adsorbent provides the highest chloride capacity in commercial service, while minimizing green oil and organic chloride formation. CLR-204 is used to treat the net gas and LPG produced in catalytic reforming units, the reactor effluent from Oleflex™ process unites and various liquid hydrocarbon streams. Optimized pore size distribution leading to higher surface area and longer bed life. High degree of macro-porosity for rapid adsorption and short mass transfer zone. GB-220 is a high capacity non-regenerative spherical metal oxide adsorbent designed for the removal of trace sulphur compounds. GB-220 is designed to remove H2S and other reactive sulphur species from low molecular weight hydrocarbon streams. GB-238 is a high capacity non-regenerative specialty spherical adsorbent designed to adsorb arsine and phosphine from hydrocarbons. GB-238 reduces arsine and phosphine to non detectable concentrations in both liquid and vapour hydrocarbon streams.